It is very easy to have pity on someone in this physical world. When people see a man that is hungry and thirsty or is undergoing similar suffering, they have great pity on him. Similarly, a person that goes undressed or barefoot, there is great pity on him as well. It is for this reason that the everyone chases after the objects and goals of the physical world. However someone that has eyes and sees souls after their arrival in the Next World, will have even greater pity on them. In the Next World there are men that go completely undressed and it is impossible to have mercy on them. Here in This World when a man is lacking clothes, it is possible to fundraise charity and create garments for him. However in the Next World it is impossible to help a person that goes undressed. 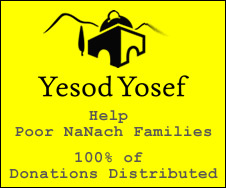 Over there no mercy helps since the only clothing a soul can wear is Torah and Mitzvos and for this no mercy can help. Still, a person that managed to attach himself to a True Tzadik during his life, can run to this Tzadik and take a garment from him so he may dress himself. Na Nach Nachma Nachman Meonen said three times each day is the best segula for shmiras habris!